Please join us for an exciting event as author Megan Whalen Turner leads us in an exploration of her novel, A Conspiracy of Kings, a middle-grade and up historical adventure about a kidnapped prince who fights to reclaim his throne and his country. There will be exciting activities and games for all and 20% off A Conspiracy of Kings! 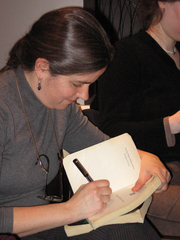 Megan Whalen Turner is currently considered a "single author." If one or more works are by a distinct, homonymous authors, go ahead and split the author. Megan Whalen Turner is composed of 9 names. You can examine and separate out names.